The story of FINAL FANTASY XII takes place in a world called "Ivalice," in an age when magic was commonplace and airships plied the skies, crowding out the heavens. A world of many races, the humes, bangaa, viera and, of course, moogles, all call Ivalice home. War was on the horizon. Seeking to strengthen its base of power, the great Archadian Empire had been invading and subjugating its neighboring kingdoms one by one. The small Kingdom of Dalmasca was one such kingdom. Our story follows Vaan, Ashe, Vaan's friend Penelo, the sky pirate Balthier, his partner Fran and many more on an adventure through Ivalice that traces the mysteries behind the Archadian Empire's invasion. Since 1987, the FINAL FANTASY series has sold over 60 million units. 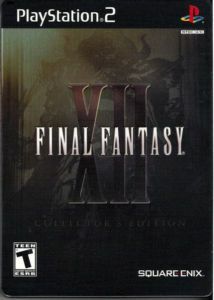 FINAL FANTASY XII carries on the proud tradition, bringing new ideas to the series and innovation to the RPG genre. Every aspect of the graphics brings color to the world of Ivalice—blues and oranges reminiscent of the Mediterranean evoke a landscape alive with a mix of European and Arabian imagery. Airships feature prominently in FINAL FANTASY XII. They come in all shapes and sizes—the main airship in this story is a medium-sized craft that measures over 1,000 feet from bow to stern. Airships are used for everything from the trading of goods to the waging of war. The story isn't all that's new—experience an evolved battle system with numerous features never before seen in the FINAL FANTASY series. 1. ADB – Active Dimension Battle is a shift from ATB (Active Time Battle), lending more realism to the battle by allowing seamless switching between the field and the battle scene. 2. Load time between the field and the battle scene that is unrelated to actual gameplay has been eliminated, ensuring smoother gaming. 3. Besides time elements, such as the attack timing, the player can fully utilize the field geography in terms of differences in ground level, intricate terrain, places with low visibility and the like. 4. Enemy monsters can also take advantage of the varied tactics that ADB offers, possessing sophisticated AI to ambush parties, back up their comrades and restore HP. 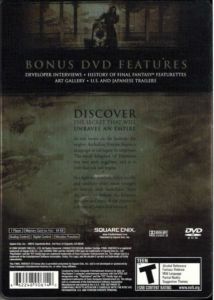 Ivalice sounds better, too, with in-game events and movie scenes presented in Dolby Pro Logic II.